Former President Barack Obama is enjoying the perks of post-White House life in the form of hefty financial industry speaking fees. Obama spoke to clients of Northern Trust Corp. in New York last month for roughly $400,000, Bloomberg reported Monday. Next week, he will be the keynote speaker for Cantor Fitzgerald LP's health-care conference, where he will be paid another $400,000, a person familiar with the arrangement told Bloomberg. Cantor CEO Howard Lutnick said Obama would speak and take questions at the conference, which lasts three days and starts Sept. 25. "Everybody would like to come," Lutnick said. "Hopefully, we will really talk about the Affordable Care Act in interesting and nuanced ways, which I think is really cool." Obama spoke last week before Carlyle Group LP, one of the world's largest private equity firms, although Bloomberg did not report if or how much he was paid. 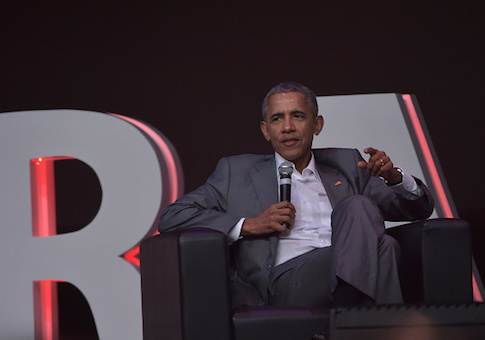 According to people in attendance, Obama talked about his life and his time in the White House. Obama has picked private equity, hedge fund, venture capital, and banking veterans to oversee his foundation, and an alumnus of Goldman Sachs Group Inc. to advise him on investments. Northern Trust is a bank that specializes in wealth management for rich families and services for big funds. The event had gone unreported, but a program accessible on the firm's website lists Obama alongside executives from Microsoft Corp., IBM, and Michael Bloomberg, majority owner of Bloomberg LP. Northern Trust, based in Chicago, gave Obama a discount on a $1.32 million loan for a mansion in that city in 2005, after he was elected to the Senate, the Washington Post reported. The rate was changed to account for an offer from another lender, a spokesman for Obama said three years later. Doug Holt, a spokesman for Northern Trust, wouldn't comment for this story. After Hillary Clinton was pilloried on the left in 2016 for giving expensive speeches to Wall Street banks like Goldman Sachs, Obama's orbit acknowledges he may take criticism from Democrats. But in his case, he is not running for office again. "Not everyone's going to be a Jimmy Carter, who does purely good works after he gets out," said Sean Coffey, a Democratic donor who chairs the complex litigation group at corporate law firm Kramer Levin Naftalis & Frankel LLP. "I don't think getting any grief for doing this is going to bother him at all." Sen. Bernie Sanders (I., Vt.), a fierce critic of Wall Street, knocked Obama in April after hearing reports that the former president would speak at Cantor Fitzgerald. "I would have hoped that the president would not have given a speech like this," Sanders said. This entry was posted in Politics and tagged Barack Obama, Goldman Sachs, Hillary Clinton, Wall Street. Bookmark the permalink.